We place our European orders about every 2 weeks. It is highly recommended that you pre-order this item now as it will reserve the next available copy we get. The players try, with their knights to win regions that are at first still in the fog, i.e. lying face-down, for their own side. These regions have different values and some also have a special functions. However, in addition to the terrestrial power of the knights, the priestesses of the old religion also have a crucial influence on events with their magic strength. With their help, you can enchant opposing knights or sorceresses so that they change sides. The uncommon thing about the game is that you may always play as many cards as you hold in your hand. But you should conserve your strength well. If you overextend yourself too much in your own turn, you won't have much to counter your opponent's attacks. It's all about knowing when you should only reinforce your side for future turns and when you should dare an attack. 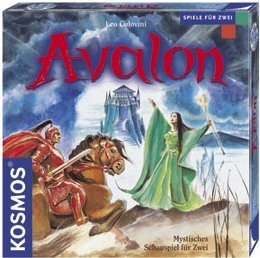 If you play Avalon with the included ruleset it is an ok game of fighting over territory, but nothing spectacular. However, with a few minor tweaks (leave out the Swamp, require one card on your territories to maintain control) it transforms into a very nice and competitive 2-player tactical placement game. I particularly like the way the enchantresses keep things uncertain by their ability to turn knight to the opposition.